**A Public Works Crew Member is on-call 24 hours a day, 365 days a year and can assist you with your utility-related emergency. If you have questions or concerns please fill out our electronic form online or return a paper copy to City Hall. Electric, Water Treatment, Sewer, Storm Sewer, Streets Maintenance, Garbage/Landfill, Compost Site, Parks Maintenance, and Public Pool Maintenance. The City of Sergeant Bluff provides electric to its citizens through its City-owned utility. Sergeant Bluff is an 8-Megawatt customer who purchases its power from MEAN (Municipal Energy Agency of Nebraska) with additional allocation from WAPA (Western Area Power Administration). Presently, there are four full-time linemen working for the community. The City has 60% of its utilities underground and 40% of its utilities overhead. The Electric Department is in the process of upgrading all electric metering systems to automatic meter reading systems. The City offers a rebate program for appliances, furnaces, and electric hot water heaters that are energy efficient. For more information on how to apply, contact City Hall at 712-943-4244. Rebate applications can be found here: Energy Efficiency Incentive Program. 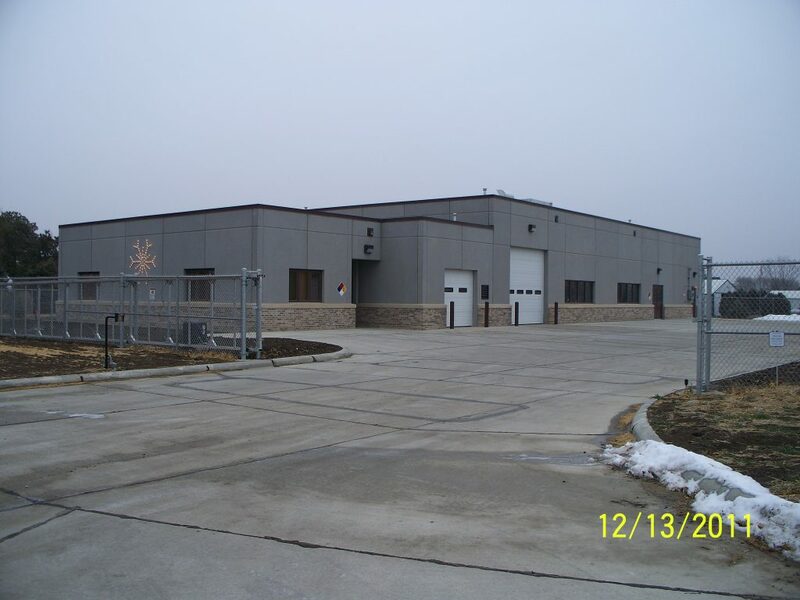 The City of Sergeant Bluff has a State-of-the-Art water treatment plant. The plant is capable of producing 2.7 mgd (million gallons per day) and has the ability to upgrade production to 4.2 mgd. Three wells were part of the construction plans bringing the total number of wells to four. These wells are capable of yielding 4.9 mgd at their peak. The water treatment plant is operated by one full-time employee who is responsible for the plant's day-to-day operations. There is approximately 18 miles of underground piping. Two ground storage tanks up on the bluff can hold 1.2 million gallons and produce the main pressure up to 59 psi (pounds per square inch). The water department is upgrading its water metering systems to automatic reading systems which will provide greater accuracy of water usage through the system. The water treatment plant produces a chlorine residual of 1.50 ppm (parts per million). Iron and Manganese are removed down to 0.02 ppm and 0.059 ppm respectively. The water hardness runs 25 grains per gallon. The City of Sergeant Bluff currently runs five sewer lift stations which pump throughout the system into a force main that flows to the Wastewater Treatment Plant located in Sioux City. These lift stations are checked everyday and are equipped with the latest technology to ensure proper function. The City of Sergeant Bluff has approximately 35 miles of paved streets. The department is responsible for storm water maintenance, signage, street sweeping, pot-hole maintenance, and street snow removal. There are many City ordinances that pertain to streets such as the Snow Ordinance. The Snow Ordinance states that after 2 inches of snowfall, all cars must be removed from the streets until the snow plows have plowed curb to curb. Do not blow snow into the street as blowing the snow into the streets puts your snow in your neighbor's driveway. Residents are required to obtain an annual pass, free of charge, from City Hall prior to taking leaves and yard debris up to the Compost Site. This will need to be renewed every calendar year. Businesses will be required to purchase an annual pass for $150.00 to utilize the compost site. Please read and complete the formopens in a new window and return it to City Hall to receive your pass. The Compost Site is open Wednesdays from 3:00 p.m. to 7:00 p.m. and Saturdays from 10:00 a.m. to 3:00 p.m. from April to November. Trash is accepted at the site for a nominal fee. The grass and brush collection center is provided for local residents at no charge. Trees and brush can be disposed of at this site as well. The entrance to the site is located at the intersection of South Lewis Blvd and South Ridge Road. Appliances are accepted for a $15.00 fee. Such appliances include the following: refrigerators, freezers, commercial coolers, air conditioning units, dehumidifiers, gas water heaters, furnaces, clothes washers and dryers, dishwashers, microwave ovens, and other items that contain mercury switches, refrigerant or PCB. Call City Hall at 712-943-4244 for more information. Items NOT ACCEPTED at the site include: electronics, batteries, paint, broken concrete, asphalt, used oil, bricks, tires, recyclable goods, fluorescent light bulbs, treated lumber (with creosote, such as railroad ties), gas and oil filters and containers, and solvents or cleaners. The opening of the compost site is with Spring clean-up week and it is the first full week in April. April 8th-13th, 2019, with weather permitting. Fall clean-up week is the first full week in November and after this the compost site closes for the year and does not open until Spring clean-up week. November 4-9 2019, with weather permitting. Stormwater can pose a risk to our water resources. Pollutants in stormwater can impact lakes, streams and rivers. New programs to control stormwater pollution have been adopted by our community. The traditional approach to stormwater management focuses primarily on flood control. Today, our city is required to manage for both water quality and quantity by using practices that infiltrate more rainfall and reduce the volume of storm water runoff. If you have a stormwater issue, please call the City of Sergeant Bluff on-call maintenance number at (712) 203-0206. The City has available, in the form of pamphlets, lots of information on how homeowners can educate themselves on methods that can be used to infiltrate stormwater. Most yards shed water and are unable to soak up rain due to compacted soils. When it rains in urban areas, water washes off roofs, lawns, and impervious surfaces such as sidewalks, streets and driveways and eventually makes its way to storm drains that drain to streams and lakes. Carried with that stormwater are any pollutants that it captures along the way. Installing rain gardens, improving soil quality and infiltration, planting native landscaping, etc. are all great ways to maintain water on your own property and lessen that which is carried away. Learn how to use fertilizers and which ones not to use. Learn more about rainscaping practices that capture and infiltrate stormwater. Create beautiful landscapes in your yard that sustainably manage stormwater. The City of Sergeant Bluff's Maintenance Department inspects and maintains the municipal pool. The department prepares the pool for opening day, completes the day-to-day testing, monitors operation during the season, and winterizes the pool at the end of the season.